Holidays are for indulging right? 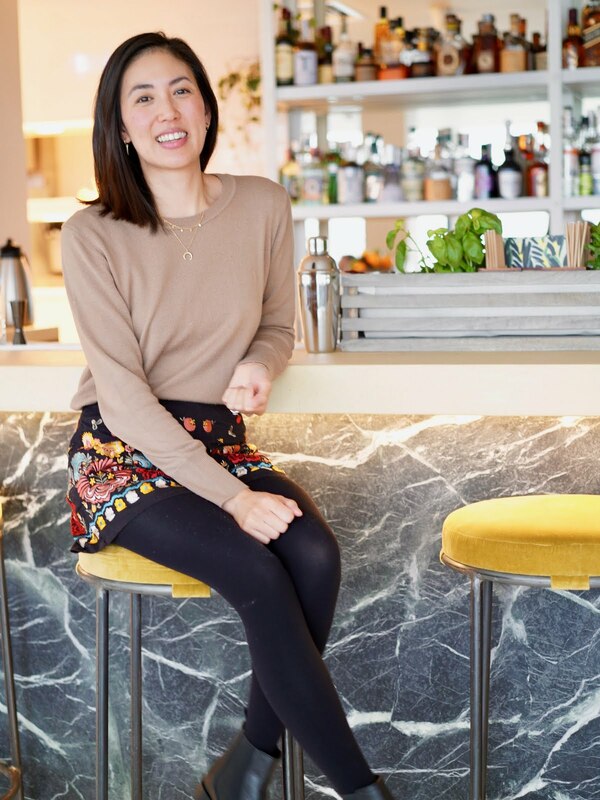 Well I definitely had my fair share of desserts whilst we were on our recent trip to Japan! There were so many different flavours and kinds of desserts to try, it was such a treat. 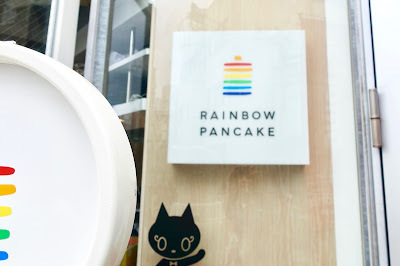 Japan may be known for it's ramen, sushi and shabu-shabu but here are 4 super cute cafes worth checking out in Tokyo! We found this place on Google and I instantly fell in love with the light and airy vibe, comfy sofas and cosy nooks in down town Tokyo, Shibuya. It specialises in soft serve ice cream made with fresh cream and condensed milk which makes it extra creamy and soft. Hang went for the hot chocolate soufflé and I had the banana and chocolate crepe, both were delicious. 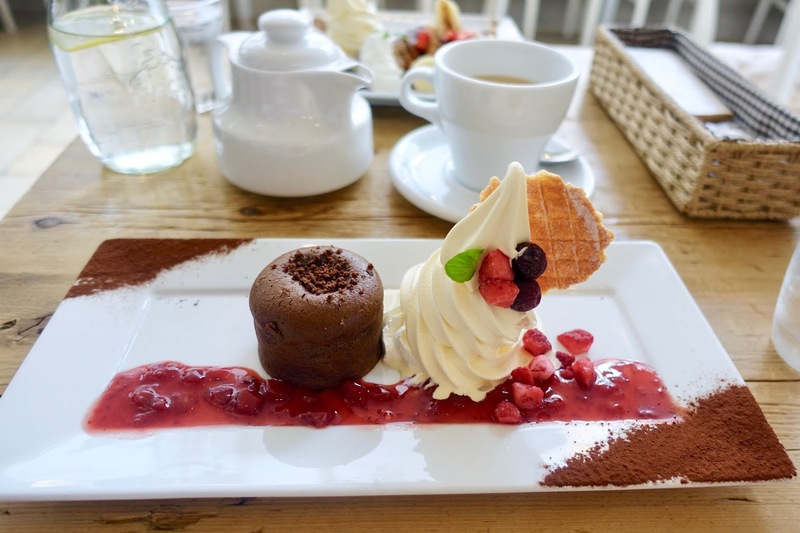 The mix of the hot chocolate pudding with the soft ice cream and berries was the perfect mix. They also do takeaway ice cream if you want to eat on the go as well as savoury dishes. This was a lovely place to unwind from the hustle and bustle of Shibuya. 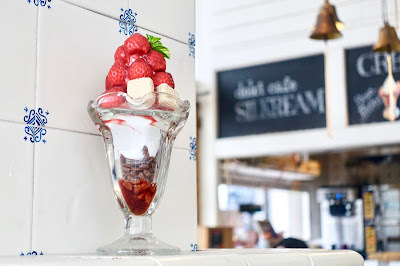 We did notice the dishes were a little bit more pricey than other places but it's worth it for that creamy soft serve! After a morning of walking around Harajuku and it started to rain, we ducked into this very small and cute cafe (has about 5 tables) around the back streets. The staff were very welcoming and friendly and after we settled in, a queue quickly formed so we were lucky with the timing. We flicked through the menu and chose the caramel apple pancake and an iced coffee to share. Most people has their own pancake but they were huge! Toppings ranged from fresh fruits, macadamia nuts and chocolate and also savoury ones. They make a fresh batter for every order and we were happy to wait patiently for our stack. 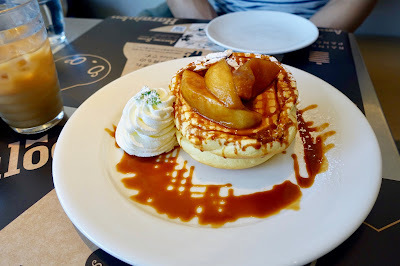 We really enjoyed the pancakes, they were really light, airy and fluffy and the apple topping was nice and sweet. 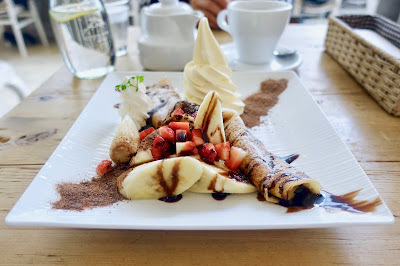 This was a reasonable price place with friendly staff and yummy pancakes, as it's very popular you may have to wait but it's worth it! 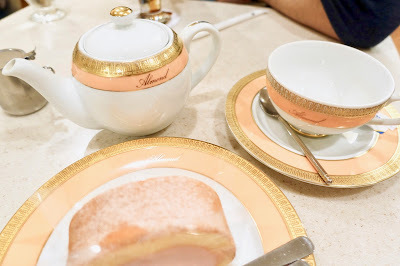 After a wonder around Ginza, the designer shopping district of Tokyo we stumbled across Almond, a French Japanese style patisserie. It reminded me of a less fancy version of Laduree, still cute though. We relaxed in the non smoking tables upstairs and perused the menu. The French toast looked amazing but I couldn't resist having some Earl Grey tea and their cherry blossom cake. 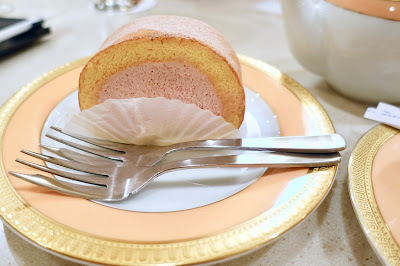 It was light and moist, not too sweet. This is a lovely place to tuck yourself away and enjoy some hot drinks and cake after some shopping. My friend Quinn recommended this place, which as the name suggest is know for their green tea desserts. It was a bit tricky to locate as we walked over from Ueno park and we were so baffled with Google Maps. After some searching we realised it's in the shopping centre in Taito at the back of the ground floor (bear that in mind if you fancy coming here!) 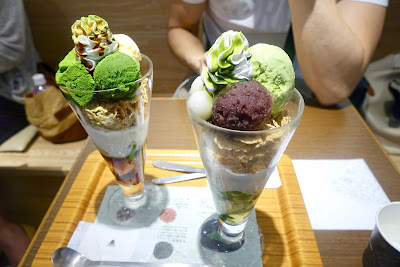 There was a queue and pretty much all the seats were taken up but we waited and ordered 2 green tea sundaes. As you can see the sundaes were huge, we did struggle to finish them! They came with a mix of cream, red bean mochi and corn flakes, which was a bit unusual but added a nice crunch. The menu is pretty extensive as you can see from all the pictures. It was also all in Japanese so we just pointed to the ones we liked the look of! 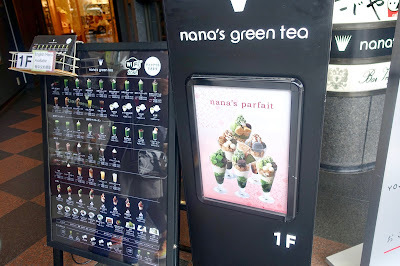 If you're a fan of green tea desserts, be sure to add Nana to your list. Which dessert do you like the look of?